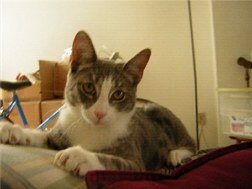 CATO WAS ADOPTED JUNE 20, 2008! 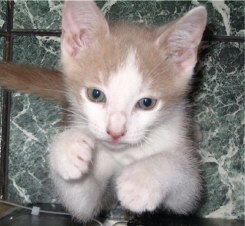 Just wanted to send you a picture of Cato - he is getting sooo big! 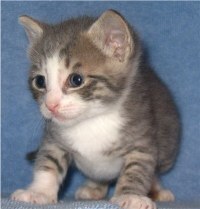 Still acting like a little kitten though. 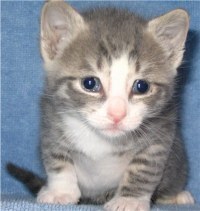 He is so cute - he's very affectionate and LOVES to eat. I swear, sometimes he seems like a dog in that he tries to get into everything to eat it and licks a lot. He's certainly getting enough kitten food, but he's always trying to get into "people" food (especially spicy foods like Thai and Indian) I caught him licking off a plate, and his face was stained with curry all day! 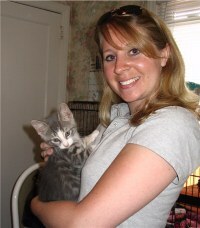 CASSANDRA AND CALEB WERE ADOPTED JUNE 20, 2008! 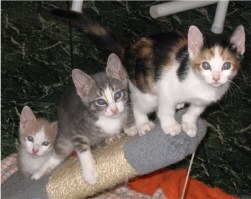 On Sunday, May 11, 2008, animal control was called to a retail store about three kittens. Somebody had parked next to a dumpster at the store and when they got out of their car, they heard noises coming from the dumpster. Upon further investigation, they discovered the source of the noise was a black, sealed trash bag inside the dumpster. 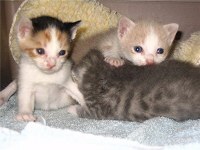 The bag was ripped open and what they found were three kittens wallowing in dryer lint, leaves, ashes, cigarette butts and other assorted garbage. 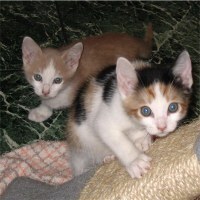 The debris was in their little eyes and mouths and the kittens were not in good shape. 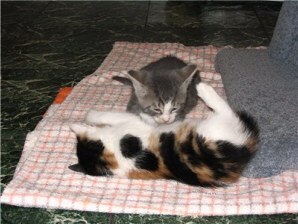 They cannot generate their own body heat at that age (about 2 1/2 weeks old) and had probably been thrown out like garbage at some point during the previous night. What is even more appalling is this store was ACROSS THE STREET FROM THE ANIMAL SHELTER!!!!!! 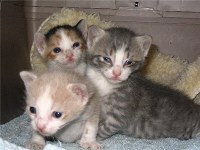 Why was it necessary to throw them in the garbage to die when they could have been taken to the animal shelter instead? 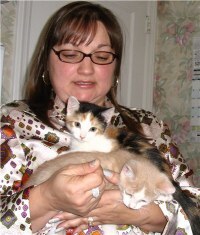 When the nursing moms at the shelter rejected the kittens, we went to get them but were not holding out much hope that they would survive. 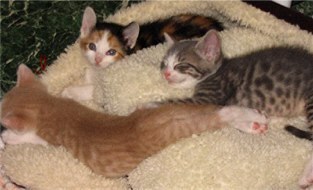 The kittens were hypothermic. Their body temperature should have been 102 degrees but they were only 94-96 degrees after being on a hot water bottle for almost an hour during the car ride to their foster home, after picking up some kitten formula at the store. 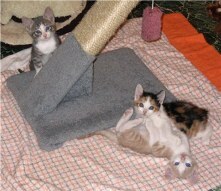 They were placed on a heating pad and gradually warmed back up. They had no interest in eating and had to be force fed with a syringe. Then suddenly, two days later, they latched onto the bottle and sucked down formula with gusto! They couldn't get enough and with eating like champs started putting on weight beautifully. 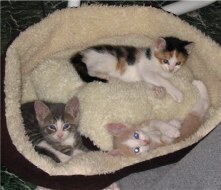 The kittens are Cassandra (female calico), Caleb (buff and white male) and Cato (gray and white male). Their birth date would be approximately April 23, 2008. Now they will live to see many more birthdays in spite of their brush with death. Caleb is the smallest. 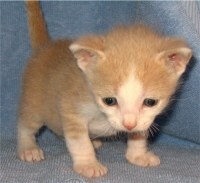 He started out at 9 ounces and put on 4 ounces in one week, which is a perfect weight gain. We think he will surpass that in the coming week because he has been sucking down his bottle better than the other two and is eating about as much as the others combined. He likes to take his time and savor his bottle, never mind that the other two are screaming the entire time because they want their turn. 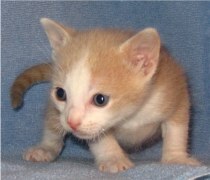 Caleb was the second kitten to start purring during the past week. Cato is the largest. 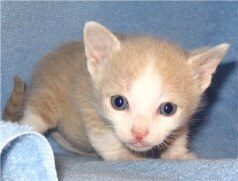 He started out at 12 ounces and gained 4 ounces during the first week, weighing in at exactly 1 pound! He chugs down his bottle, then lies in his foster mom's lap and purrs so loudly. He likes to take a few minutes after scarfing down his bottle to bask in the after mealtime glow. 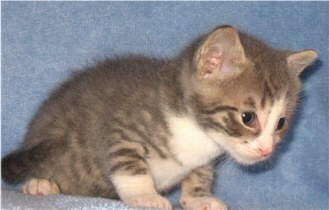 Cato was the first to start purring and it takes nothing to get him started. Everything makes this boy happy. 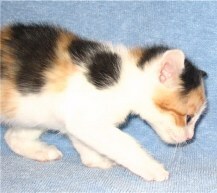 Cassandra is already a typical calico. Prissy, prissy, prissy! Her bottle has to be just so. She has to be in a perfect eating position. If everything isn't right and the stars are not aligned properly, she fusses and won't eat. 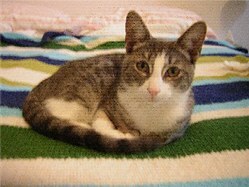 Eventually, her foster mom gets it right, all is well and Cassandra purrs. 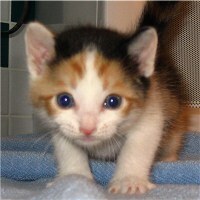 She was the last to start purring because it took her foster mom so long to figure out how she prefers everything. 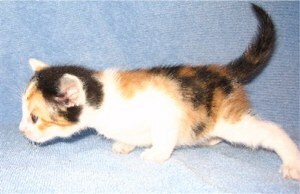 Cassandra started out at 10 ounces and gained 3 ounces during the past week. 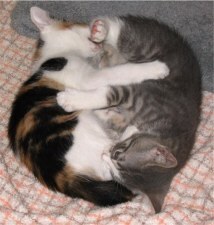 It's been a busy week for the kittens! 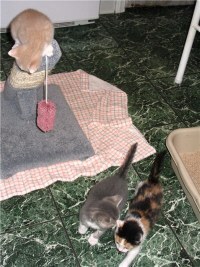 Within the past week and a half, they have learned to use the litter box consistently, they started eating Royal Canin Babycat food as soon as it was offered to them and are now telling their foster mom they don't want that stinkin' bottle any more. They are running around the kitchen several hours a day for exercise, playing with each other and with toys, and have socialized with the dogs we trust to be gentle with them. They have no fear of the dogs and will walk right up. In fact, they stick their little paws through the baby gate to visit with the dog we do not trust with them! 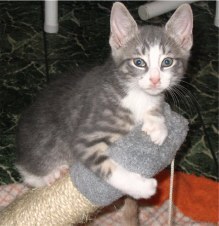 They have also started using their scratching post and love to climb on top of it. The kittens had their first vet visit and they all checked out fine. 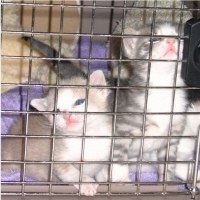 They received their first distemper shot and all tested negative for feline AIDS and leukemia. Don't want you to think that all they do is lie around and relax. 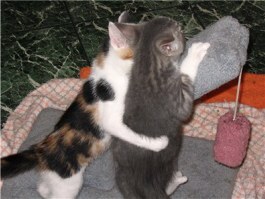 Oh no, they are on the go and are perfecting Kitty Kung Fu Karate. It's just that resting time is the only opportunity there is to get them all in one picture. 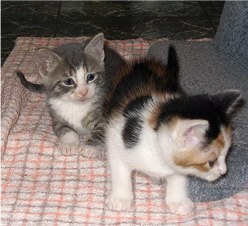 The kittens will be ready for adoption around the 1st of July. We will be accepting applications in the meantime. If interested in adopting, please complete an adoption application. Due to an oversight on their foster mom's part, we were able to determine just how litter box trained the kittens really are. It wasn't until they had been running loose in the kitchen for a full 5 hours that the foster mom realized she had forgotten to put the kittens' litter box on the floor. The minute she put the litter box down, all 3 kittens jumped in and peed and pooped. 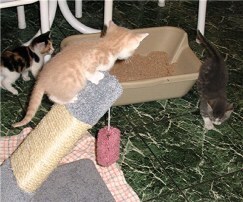 Bless their little hearts, they could not get to their litter box so they held it until their litter box was made available.